If you’re looking for a perfect homemade Holiday gift this year, or a perfect treat for yourself—here it is! 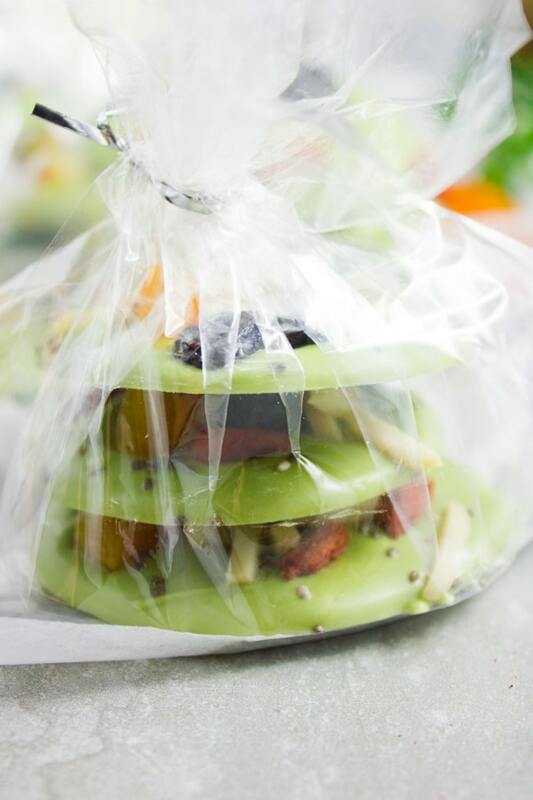 A Matcha Green Tea Chocolate Bark recipe is my top pick for you. Love the Holidays! Love the food, the mood and everything that comes with it..and I absolutely love Homemade Holiday Gifts. 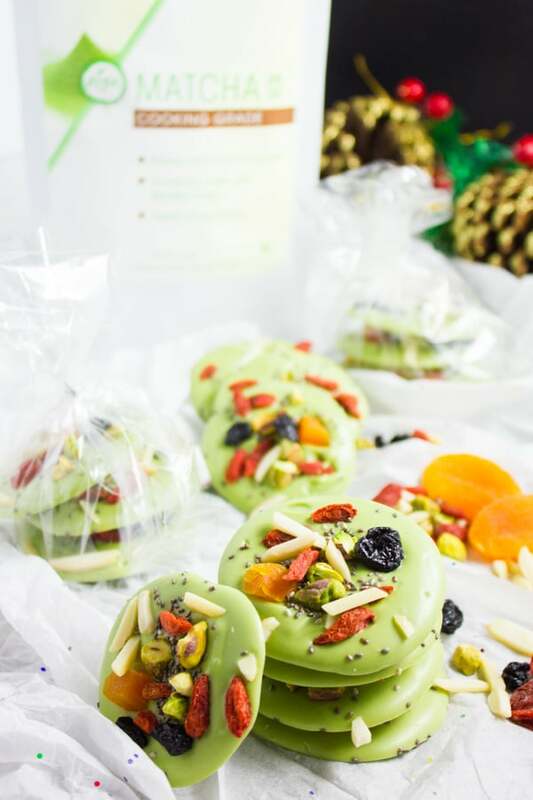 Especially if they’re something like this Matcha Green Tea White Chocolate Bark! Aside from how absolutely divine these barks are, they’re super festive too. Vibrant gorgeous colors, amazing textures and rich flavors with plenty of rich superfoods to put an extra smile on your face while you enjoy chocolate! 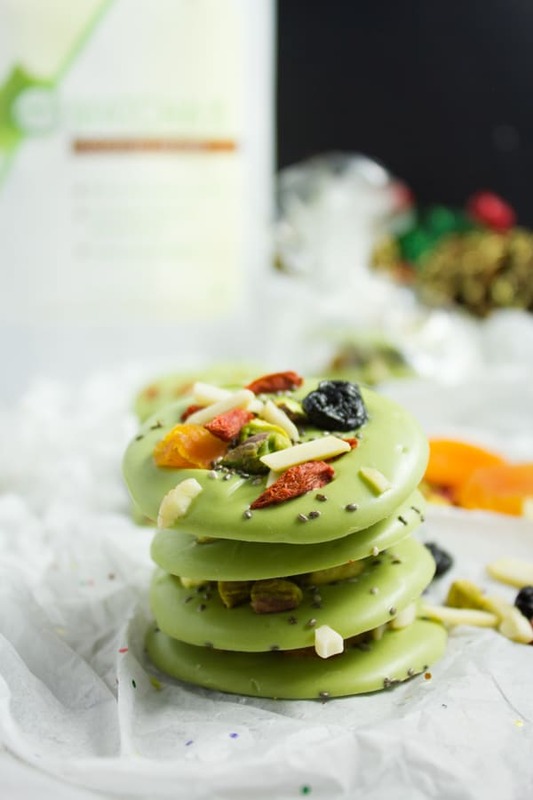 This emerald green Matcha chocolate bark is absolutely divine with the unbeatable flavor of Matcha green tea and plenty of superfood toppings. 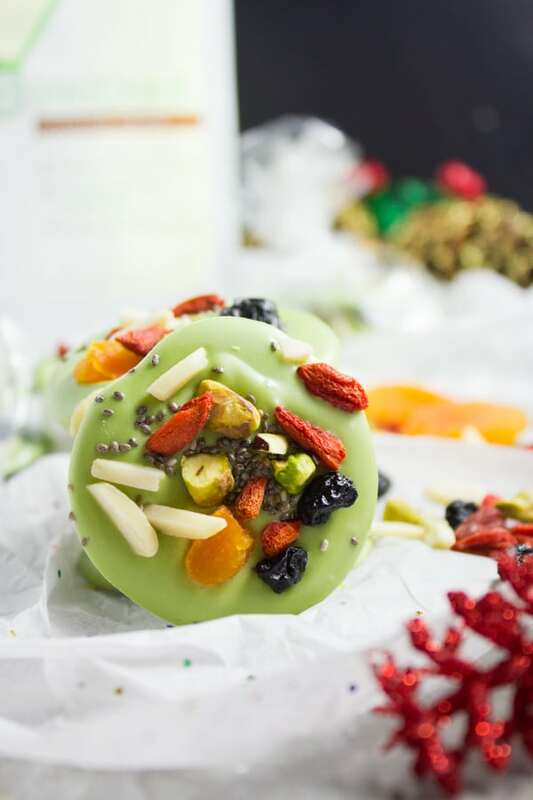 The crunch from the pistachios, chia seeds, and almonds with the sweet chewy goji berries, dried wild blueberries and apricots are all rounded off with the sweet vegetal flavor and antioxidant power of matcha green tea! Have you guys made chocolate bark before? Well, let me tell you it’s so easy, and yet so divine which makes these little rounds my go-to pick when I need to give a homemade gift. Plus you can dress these with endless toppings—so feel free to customize them your taste or your guests’ taste. Today I’m picking a variety of superfood toppings to pair beautifully with my matcha green tea flavor and health benefits. Pistachios, almonds, dried blueberries, goji berries, chia seeds, and dried apricots. 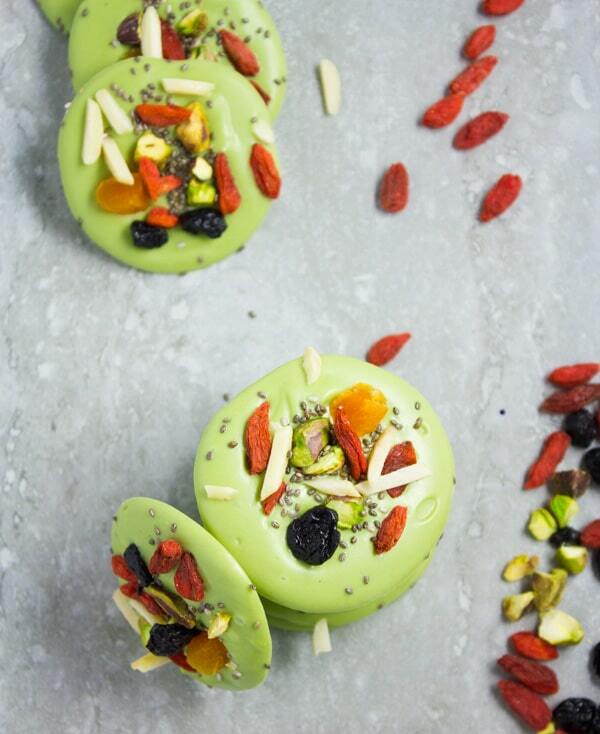 Just imagine all those flavors and textures combined together with every bite of pure Matcha lush! Now, if the word Matcha doesn’t ring a bell for you let me tell you: You are MISSING out! Even though it’s green tea, I rarely refer to it as green tea, only because it doesn’t compare to what we know as green tea. Matcha is the pure leaf of tea, grown ONLY in the shades, ALWAYS handpicked, dried and ground by VERY slow and low friction stone mills, then whisked by a bamboo stick. So the result is a vibrant emerald GREEN colored powder, a deep taste of pure green tea leaves with a sweet note, velvety smooth feel and a load of NUTRIENT! So clearly, matcha is NOT your average green tea. Gather all your ingredients and chop or grate the white chocolate. 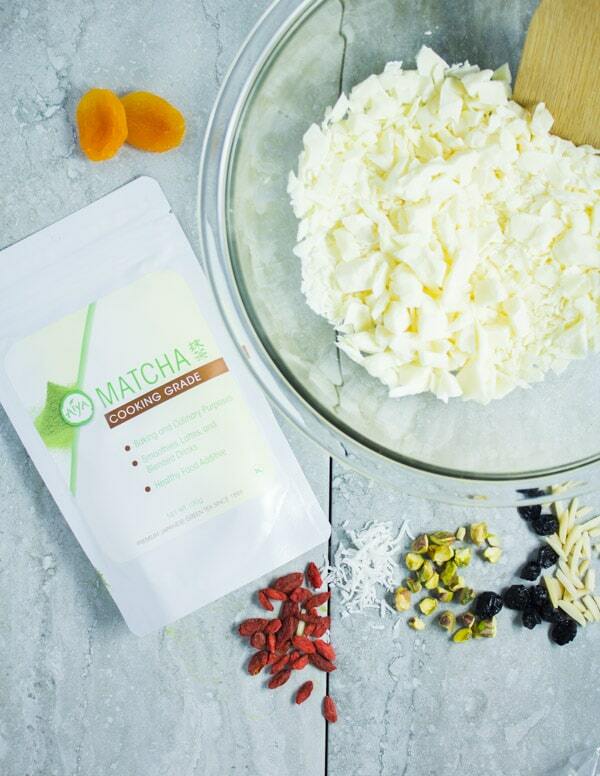 Now, you’ll melt your finely chopped white chocolate and then add the Matcha green tea powder to it. Once you whisk them together, the white chocolate turns a bright emerald green color. 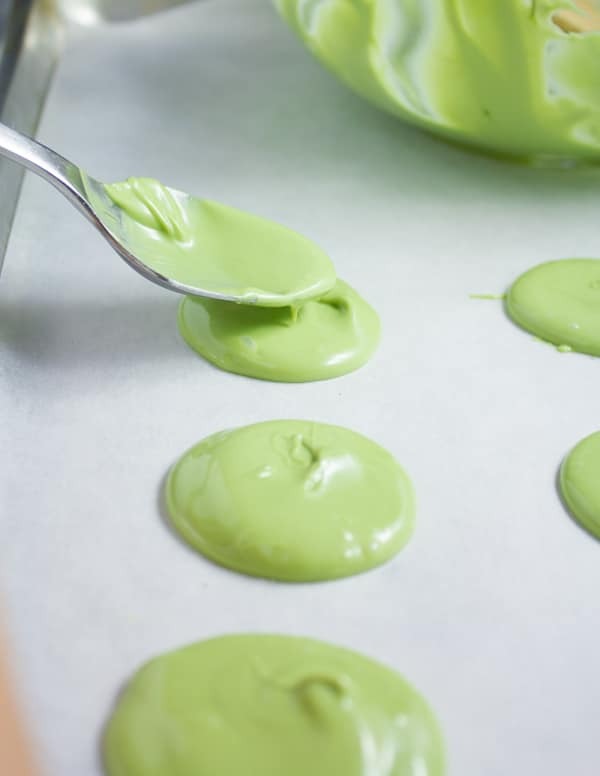 On a parchment lined baking sheet, you’ll spoon a tablespoon at a time of the matcha chocolate mixture. It will flatten into that perfect round shape you see. You can always adjust any edges or tops with the spoon. Then you’ll start sprinkling your favorite toppings and let the chocolate bark set. When I’m rushed, I’ll chill the tray in the fridge to set faster. This Matcha Green Tea & White Chocolate Bark is NOT your average chocolate bark! Nope, it doesn’t even come close and it doesn’t taste like a sugary overload of chocolate with a type of nut. It tastes like smooth mild white chocolate balanced with an earthy clean green tea note. When you add the toppings, you’ll taste some crunchy pistachios, almonds and delicate chia seeds with chewy dried apricots, blueberries and goji berries. While all the toppings are totally optional, I strongly recommend you keep the goji berries—they’re a powerful anti oxidant and anti-inflammatory (among many other benefits), and the chia seeds (they are loaded with fibre, protein and omega 3). These two ingredients combined with the benefits of Matcha green tea, make this divine little treat a healthy powerful one too. 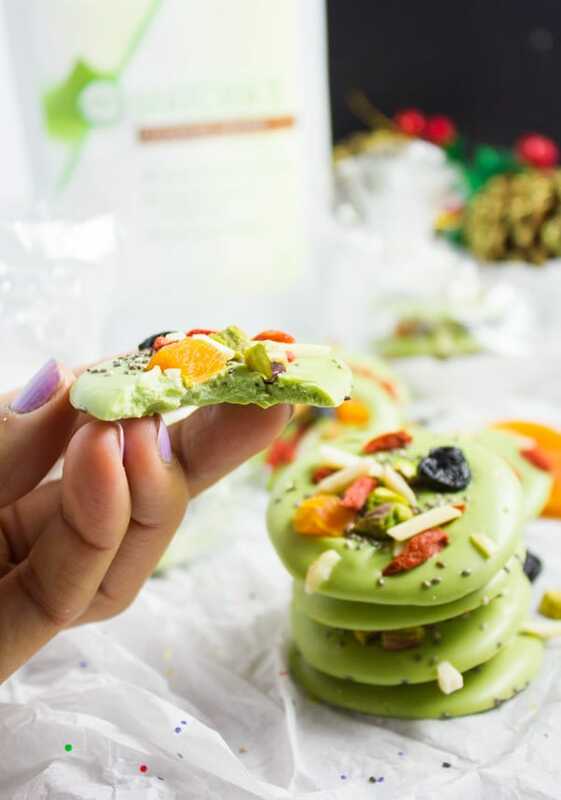 Did I mention that these matcha white chocolate bark rounds are also easily made in advance? I’ve given away a few of those little bags already and everyone’s been asking for more! I can’t urge you enough to make this Green Tea White Chocolate Bark as little Holiday gifts this year. Everyone will enjoy it. Plus you can prepare these chocolate bark rounds well in advance and dress them up endlessly. P.S For more Matcha goodness, don’t forget to check this Matcha Power Hummus recipe and these amazing Banana Matcha Energy Bites recipe. For a faster setting, you can chill your chocolate bark in the fridge. Add any chopped nuts or fruit on top. Dried blueberries, candied ginger or freeze-dried strawberries also taste delicious. For the superfood version, stick to chia seeds and goji berries and enjoy the added benefits of antioxidants and omega-3. 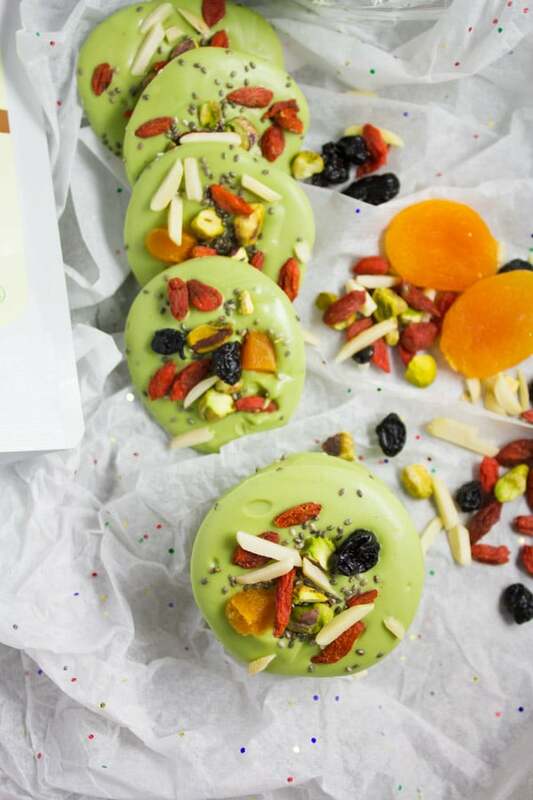 The Matcha Chocolate barks can be kept in the fridge in an airtight sealed container lined with parchment paper for a month and a half, or at room temperature for three weeks for optimal taste and freshness of the toppings. 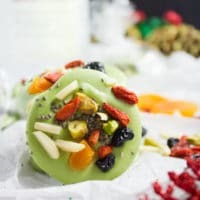 If you’re looking for a perfect homemade Holiday gift this year make this Matcha Green Tea White Chocolate Bark topped with assorted superfoods like chia seeds, dried blueberries, and goji berries! Add the white chocolate in a microwave-safe bowl. Microwave for 45 seconds and whisk it until smooth. Alternatively, you can place the white chocolate bowl over a larger bowl with boiling water and whisk it until it melts completely. 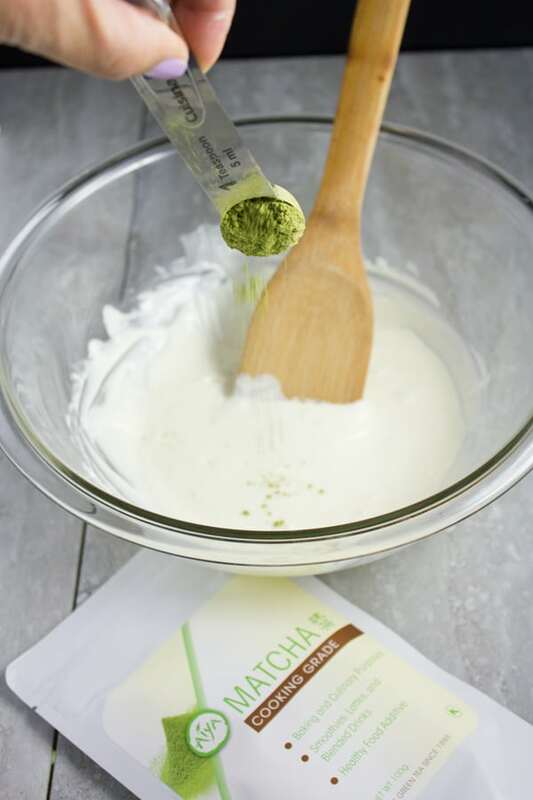 Add the Aiya Matcha green tea powder to the melted white chocolate and mix it in until all blended. Take a tablespoon measuring spoon and spoon out a tablespoon at a time on to the parchment paper spacing the tablespoons half an inch apart. 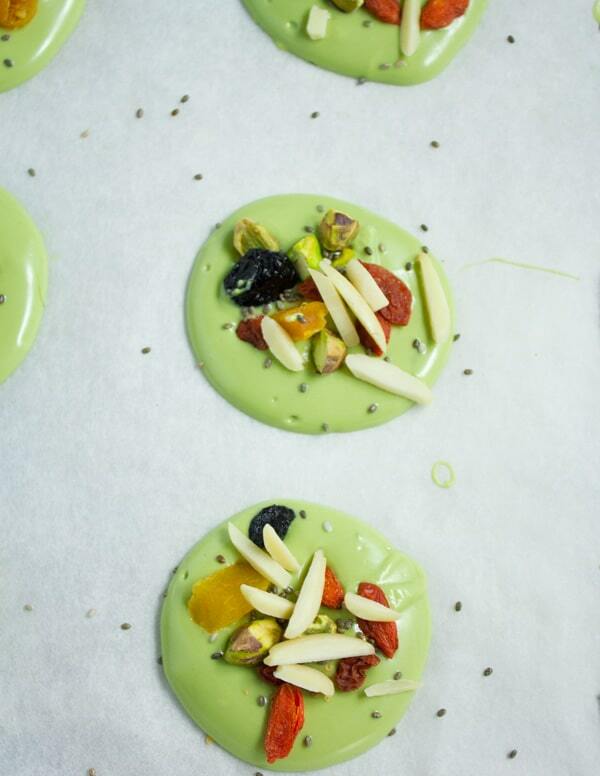 The Matcha chocolate will spread out into a circular shape about an inch and a half in diameter. You can use the back of the tablespoon to even out the tops or edges if you feel you need to. 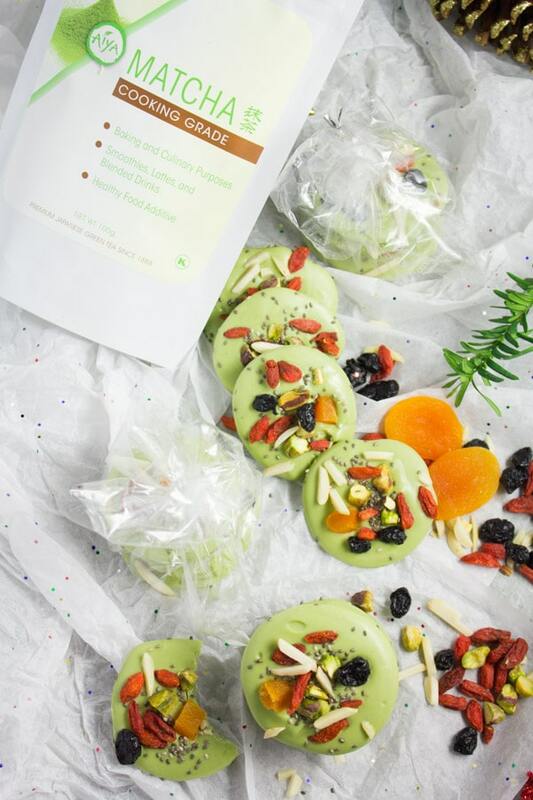 Start sprinkling the superfood toppings over the smooth matcha chocolate rounds and let the chocolate set for 30 mins at room temperature of 5 mins in the fridge. Serve the Matcha chocolate barks and enjoy! Or stack them up in a bag for gifts. These would make a wonderful (and healthy!) holiday gift, thanks for sharing! 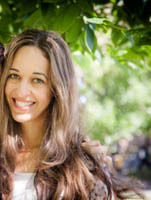 Matcha green tea is best detoxifying drink and it can easily be added to anything.